Del Mar al Lago is a restaurant that is a favorite amongst local chefs, and once you visit, it will be a favorite of yours as well. Meat is on the menu, but fish has the starring role. For starters, the house salad, with either spinach or romaine, guanabana-infused creamy dressing, and a handful of perfectly fried squid is almost a meal in itself. The Choritos Rellenos de Mariscos appetizer is chopped mussels, shrimp, scallops, octopus and calamari with lime, garlic and onion served heaped in mussel shells. No flavor dominates, just a fresh wonderful burst on your taste buds. New to the Peruvian take on seafood? 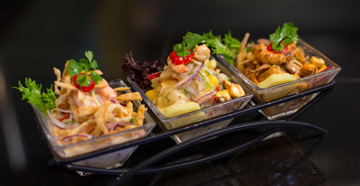 Opt for either the Cebiche Tasting, or the Cebiche Fusion 3 Continentes. Fresh and delicious, it has hints of curry, chipotle, mangoes, or aji amarillo. Del Mar al Lago also features a pesto pasta, which is smooth and rich. The Paella is a ‘rico suave’ version of its Spanish counterpart, lighter in the saffron, full of shrimp and flavor. Piqueo Norteno is a trio of their most popular dishes: cebiche, mixed fried fish, and paella. The plate is generous and there is plenty to sample with your friends. Finish with a dessert, all made in-house. They include the Maracuya Cheesecake, the Torte Derretida-a molten chocolate cake with hints of cinnamon and soft burn of Rocoto chili or the Crema de Guanabana–soursop custard with Grand Marnier macerated berries. Or try all three, if you have room! Bring some hungry friends. Order an excellent Pisco Sour and some of the best food you can eat anywhere. Share. Laugh. Take home leftovers. Salud a la vida!